The "Canopy" dance is a stage choreography, of course, with no basis that I know of in Armenian culture. (That doesn't mean that one does not exist. I'm constantly amazed at the complexity and richness in the rituals and folklore in Armenia). However, I suspect the inspiration was probably from a Moiseyev number. I don't know what that number would have been inspired by (A Jewish wedding ritual?). I seem to recall seeing an Azerbaijani ensemble performing a similar dance some years ago, but that may have been as fanciful and spurious as the Armenian counterpart. Anyway, the word for "canopy" is "ambhovanee" (western Armenian) or "amphovani" (eastern Soviet Armenian). I saw Mandala perform it many years ago, but I don't remember the melody used at the time. If you contact Martin Harutunian, the leader of the Aravod Band in Boston, he might be able to help you. His knowledge of Soviet Armenian melodies is far more extensive than my own. 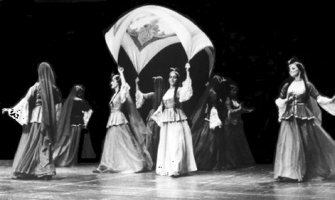 The melody will probably prove to be a stage composition or arrangement by Khatchadur Avedissian, as are so many of the most popular and catchy Armenian stage numbers.